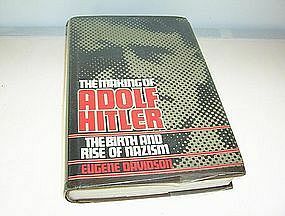 The Making of Adolf Hitler The Birth and Rise of Nazism by Eugene Davidson is a library discard book which has the pocket removed and the plastic cover protector still on it. It has written in red ink Discard on title page and back cover. The book shows normal wear/tear/scuff marks on edges. Please email me for any questions. Will accept money orders and cashier checks. Will also accept personal checks with UP to 10 days to clear.